'Vellarikka'(Cucumber) Kichadi is another side dish in a traditional Kerala 'sadya'(feast). As I said in my earlier post Kichadis and Pachadis are must-have dishes in sadya. Kichadi can be made with cucumber/beetroot/lady's finger(okra) in a ground coconut mixture and well beaten curd. It is a perfect combination with rice and curry. In this preparation cucumber is deskinned and cut into small pieces. It is then cooked with salt and spices and then later with ground coconut mix. 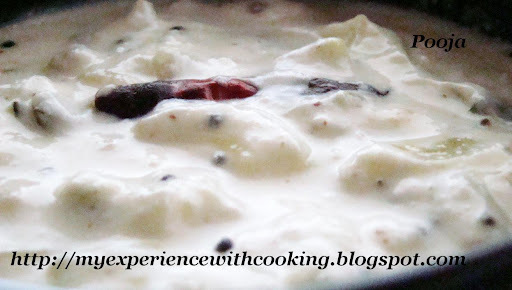 Well beaten curd/yoghurt is added towards the end of preparation. Grind the ingredients to be ground adding water till it becomes a smooth paste. Keep aside. Add cucumber pieces to a small pan along with green chillies and enough salt. Cook till it becomes soft. There is no need of adding water to cook cucumber as it contains enough water. Meanwhile heat 1 tsp coconut oil in another pan and splutter mustard seeds. Add curry leaves and red chillies and saute for few seconds. Keep aside. Add the ground mixture to the cooked cucumber pieces and cook for few minutes more. Add well beaten curd, mix well (with continuous stirring) and remove from heat. Do not let it cook after adding curd as it would curdle. Adjust the salt at this stage. Add the seasonings kept aside and mix well.